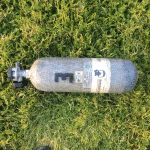 We have Air Tanks For Sale. 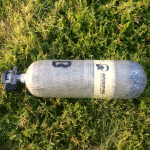 Save money with used SCBA tanks. 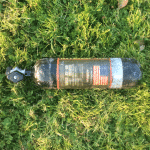 4500 psi SCBA tanks work great for filling your PCP airguns. Our SCBA tanks have a tank pressure gauge built in to the fill valve. This makes it easy to grab a tank and check the remaining pressure in the tank. Before purchasing a scba tank please do your research and find a place that can fill them to 4500 psi. Along with a scba tank you will need a pcp fill adaptor that connects to the tank and attaches to your airgun. We recommend our Stikman Fill Adaptor. 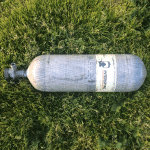 Advantages of SCBA tanks over the “all in one tanks” marketed to airgun people. All in one tanks have the fill system integrated into the tank valve, this drives the cost per tank up. 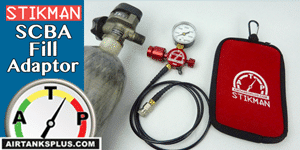 With a scba pcp fill system, you move the fill adaptor to the tank you want to use. This allows one fill system to work with many tanks. If you want to cascade fill (fill from two tanks to make the air go farther) check out our stikman and cascade man combo. SCBA tanks have a 15 year service life from the date of manufacture, and require a hydrotest every 5 years. If a tank is older than 15 years and or it is out of hydro, then businesses like dive shops or paintball shops WILL NOT FILL THEM! People who buy thanks that are close to expiring because they plan on filling the tanks with their own compressors.